On September 5, President Trump rescinded the Deferred Action for Childhood Arrivals (DACA) policy, created in 2012 to allow undocumented immigrants brought to the United States as minors to remain and become eligible for work permits. 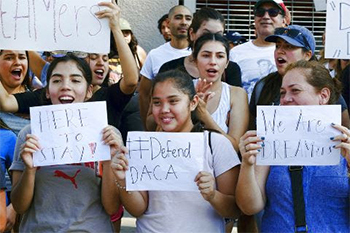 The Redemptorists of the Baltimore Province agree with the recent statement from the U.S. Conference of Catholic Bishops (USCCB) that the decision to cancel the Deferred Action for Childhood Arrivals (DACA) program is reprehensible. We also agree with the Conference of Major Superiors of Men (CMSM) that the decision is unacceptable [and] unjust and not only puts these children of God at risk of deportation in the near future but also even death in unknown, often dangerous countries. Ministry to immigrants, without discrimination, especially the poor and vulnerable, has been part of the Baltimore Province’s priorities since our beginning.